Nikon | Imaging Products | Best of the Rest / Nikon Family Cousins, Part 15 : "Nikon F-501" and "Nikon F-301"
Home > Products & Support > Imaging Products > History > Camera Chronicle > Part 15 : "Nikon F-501" and "Nikon F-301"
Part 15 : "Nikon F-501" and "Nikon F-301"
Nikon F-501 (N2020) (Photo: right) was released in April 1986. Around that time, there had been no increase in the sale of the 35mm (135) format SLR camera. The lens-shutter type 35mm compact camera was getting more convenient because it was equipped with speedlight (electronic flash), auto focus and auto winding and rewinding. Beautiful photos can be easily taken with a compact camera, without taking a trouble to use a large and heavy SLR camera. Each manufacturer took various countermeasures to recover the popularity of the 35mm SLR which was losing its edge to the growing compact cameras. One of them was the built-in auto winding and rewinding, and the other was the auto focus. Nikon F-501 and its sister model F-301 (N2000) (1985, photo: left) were born in such background of the age. The growing popularity of the compact camera owes to the putting of auto focus into practical use. If so, all that to do seemed to equip auto focus with the SLR, but things wouldn't work out so easily. In case of SLR, if the subject image is in focus or not can be observed by the naked eye on the finder screen, right on the spot, therefore, the performance of the auto focus device will be easily found out. And, those who are practiced with the focusing with an SLR, don't suffer inconvenience from the manual focusing. It means that "one may as well do without auto focus than with an incomplete one". Nowadays, it is a matter of course that an SLR camera is equipped with an auto focus mechanism, but, at that time, there had been a serious discussion among the people concerned regarding the subject "is auto focus necessary for SLR ?" Apart from that, the development of auto-focus mechanism for SLR had been steadily proceeded. Nippon Kogaku K. K. (present Nikon Corporation) already announced the prototype of an interchangeable lens equipped with built-in auto-focus mechanism (AF Nikkor 80mm f/4.5) at "Photoexpo" held in Chicago in April 1971. Following that, other manufacturers announced various types of prototypes and offered topics each time. On the other hand, regarding the auto winding, there had been a tendency toward to build it into an SLR. In 1979, Konica FS-1, and, in 1980, Contax 137 MD Quarts were released, and those SLR models having built-in motor drive or winder which were so far sold as external accessories and having no manual winding mechanism were becoming accepted by the market. For Nippon Kogaku, as a pioneer of the motor drive since Nikon S2 and Nikon SP (1957), range-finder models and Nikon F (1959), an SLR model, it is quite natural to develop an SLR with built-in auto winding, and the requirement of the market was also going to that direction. The question was if the auto focus was also to be built into or not. Nippon Kogaku turned out to release Nikon F3AF in 1983, which was an auto focus SLR model practically serviceable anyhow, but as mentioned before, the value of an auto focus for SLR was in question and the feasibility for actual business was unforeseen around that time. 2.) an auto focus model with built-in auto winding. It was in 1982 when MINOLTA Alpha-7000 which was destined to decide the direction of later AF SLR was not yet announced. At the beginning, it was studied to adopt the system of Nikon F3AF (with AI AF Nikkor 80mm f/2.8 and AI AF Nikkor 200mm f/3.5 IF-ED) which equipped the motor inside the lens barrel but it was abandoned because it would make the size of the interchangeable lens larger and cause the cost increase. And the method with which the motor was equipped in the camera body and the driving force being conveyed to the lens via the coupling (AF coupling : coupling means a connecting device) was adopted. Later, the motor-in-the-lens system was released by a few makers and an advantage of "optimum driving device can be incorporated into each lens" was exaggerated, but it would depend on the type of the lens. With the super telephoto lens, the motor-in-the-lens system is certainly better for its efficiency but with the wideangle lens and the normal zoom lens, the motor-in-the-body system is favorable due to its size and cost (=price, from customers' side). The AF system of the present Nikon (though depending on the model) is able to cope with the both of them, and it proves the goodness of the choice at that time. If the motor-in-the-lens system were chosen at that time, it would have never been possible to take in the advantage of the motor-in-the-body system as well. Realization of AF naturally accompanies the change of interchangeable lens system. It is natural to equip the AF coupling to convey the rotation of the driving axle of focusing to the lens, since it is driven by the camera body, other information items regarding AF as well must be communicated between the camera body and the lens. Nippon Kogaku dared to adopt the communication system between CPU's, in order to make these communications. Via electric contacts, necessary information items are exchanged in time series between the CPU incorporated in the camera body (main CPU) and the CPU built in the lens. Information for exposure as well as for AF is transmitted. In this way, more information can be exchanged with limited number of electric contacts. Not only set aperture and maximum f number used for exposure control so far but subtle compensation value particular for each lens can also be informed and is helpful for the improvement of the accuracy of exposure control. I have heard of the discussion about "Taking this opportunity, let's change the lens mount". However, this proposal was denied because the confidence was obtained to cope with new specifications foreseen in the distant future without changing the lens mount. In the F-501?, not only auto winding, and AF but also various new functions were included: auto film loading, auto speed setting for DX-coded film, control of camera function by CPU, to name a few...... The load to the team that developed these many new things was very heavy but they attained the release of the product in the targeted period by harmonious and efficient teamwork despite the short period of development. 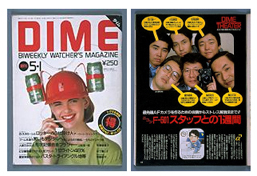 The story of that development team was covered by the inaugural number of a magazine "DIME" (May 1, 1986, issued by Shogakkan) (Photo: left). The profile of team members and their activity was introduced over five(5) pages in a merrily way with many photos and illustrations. It was very rare then that the development team of a camera appeared on a general magazine like that, and it must have been a valuable experience for them. Looking at the picture now, appearances of them changed remarkably since then; some have lost hair, some have got extra weight......it makes us conscious of the passage of time. In 1985, the same year as the F-301 (N2000), MINOLTA Alpha7000 was released, and it was the beginning of the new era. The SLR which had been slow moving due to the popularity of the compact camera, recovered its sale again. The F-501 released in 1986, close on the heels of MINOLTA Alpha-7000, -- Alpha-5000, as well as the F-301 was not so distinctive as the MINOLTA Alpha-'X000' series, but its contribution for founding the base of the present Nikon series must not be treated lightly. The fruit of their efforts which was described in a merrily way in the DIME magazine was succeeded uninterruptedly in silver-halide cameras and newest models of digital cameras of Nikon.